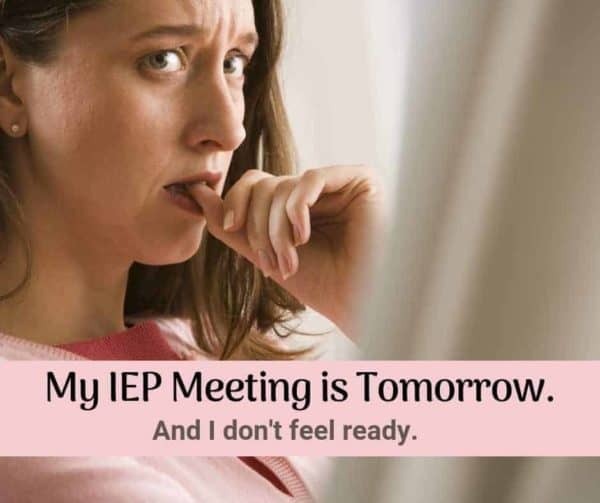 My IEP Meeting is tomorrow! Home » IEP Advice for Parents » My IEP Meeting is tomorrow! When you need last minute IEP advice….likely a Special Education Advocate is the worst person to ask. I could talk about IEPs and special education strategies all day long. And, I have. There are probably only a few thousand people, at most, in this country, who know as much about IEPs and the IEP process as I do. That being said, I am probably the worst person to ask for help at the last minute. I sometimes get as many as a dozen emails a day. I have a disclaimer on my site that I cannot guarantee personal assistance. In fact, I don’t read them all thoroughly. I honestly do not have the time. It could be a full time (yet non-paying) job to answer the email I receive. I could get sucked into free full-time consulting if I allowed it. Yes, yes it does. And that’s what I do. I put it on here so that the information can be available to the masses. Before I get into why I am the worst person to contact at the last minute, I want to give you some helpful information. These tips on your first IEP meeting are a compilation of talking with advocates and the group admins. They are based on trends we see and what you can really do as a parent if your IEP meeting is less than 24 hours away. Dress appropriately. In that post, you’ll find suggestions on what to wear to an IEP meeting. Treat it as a business meeting. First and foremost, this is a business meeting. Your goal is to get your child’s needs met. You’re not there to make friends or pass out donuts or gain allies in a battle for services. You are there as an equal member of the IEP team. You are an expert. Nobody knows this child better than you do. Be solution oriented. Come to the table with suggestions on what you think will work to address your child’s needs. Accept that “you don’t know what you don’t know.” I’ve been attending IEP meetings for over a decade, I still learn new things every week. Don’t think of this as stress, use it as a strength. There is a lot about IEPs that we don’t know, and that’s fine. We can learn. We will learn. You will NOT learn it all today or tomorrow, so don’t even try. Stay away from websites like Wrightslaw because you’ll be overwhelmed. Go with your gut. Remember that many school personnel is not well versed in IDEA or state regs. School teams learn at conferences and in-services and by word of mouth. They may be right. But sometimes they are misinformed. If it doesn’t feel right, just table it: “I’d like to think about that for a few days before making a decision. Let me get back to you.” Boom. Done. Step out of your comfort zone. For some parents, this might be speaking up and challenging the opinion of a well-degreed administrator. For others, it might be sitting calmly at the table rather than jumping across it and throat-punching someone. Know your strengths and your weaknesses. Rehearse in the car. Rehearse in the shower. But do what you need to do to advocate and remain professional. If at all possible, bring someone to take notes. You want to be able to focus on the conversation. If you have to do it yourself, so be it. Pat yourself on the back. You are ahead of the curve. I cannot even tell you how many parents don’t seek help until it’s practically too late to do anything. Some actually contact me in the spring of their child’s senior year! You are seeking out assistance now. There is strength in numbers and you will find tremendous support in the group and on the blog. Do read your procedural safeguards. Not at the meeting, of course. But at some point, read them. At least scan them online beforehand and know that there are well-defined procedures to handle disputes. Now is not the time to worry about “well what are my rights?” because there are too many to list. If you follow your gut and these guidelines, it will be hard for your rights to be violated. Make a plan to be better prepared next time. There are 5 essential parts of the IEP process that every parent needs to participate in. Learn them, do them. You won’t have time today, but you can plan ahead. Allow yourself to be pushed into anything. See number 6 above. If it doesn’t feel right, don’t agree to it today. Don’t allow yourself to become overwhelmed in the 11th hour. Nothing has to be decided upon today. The IEP meeting is merely one step in the IEP process. It is by no means the be all, end all of the IEP. If you need to, step away from the computer. You can start reading one article which leads to another and another and it can be overwhelming. Go, listen, take notes and then follow up. Try to be too casual or chummy with the team. We all want to like and respect our team, but this is not a social gathering. This is a business meeting. Everyone around the table, except you, is being paid to be there. Treat it like you are at work too. Don’t sign anything except the attendance sheet, the IEP meeting invitation (if you have not previously done so), and the sheet stating that you received procedural safeguards. Nothing else HAS TO be signed today. Nothing. No matter what they tell you. Absolutely positively do not let them just read you an IEP and hand it over to you at the end to sign. No way! That is directive, not collaborative. Table it, and come to the Facebook group for advice. Don’t make threats or accept threats. I’ve heard it all. I’ve heard parents threaten to call lawyers, threaten to file OCR complaints, or call well-connected relatives. None of it matters. Stay child focused. What does your child need? Sure, you can always file state complaints or OCR complaints if that is the right course of action. You just don’t threaten them with it as it makes you look unprofessional like you don’t have the data to make your case and it will ruin your credibility if you cannot or do not follow through. Accept threats: The most common one I hear, “Well, we cannot implement the services in this IEP until you sign this.” And they’re right. But so what? Will a few days or weeks truly affect your child’s outcome? In the big picture, probably not. Don’t accept crappy parts of the IEP just to get the good parts. Again, see the item above. Look at the big picture. Delaying services for a few days or a few weeks likely isn’t going to make a huge difference. And, speak with a local advocate–you can do a partial acceptance of a proposed IEP. But you want to make sure that you word your PWN correctly, so get advice first. Bring in a note taker and an advocate or moral support if you need it, but that’s it. Do NOT bring in a whole posse of people who are not necessary. You will be outnumbered. That’s ok. I’ve once not been outnumbered at an IEP meeting, nature of the event. But I’ve seen parents try to combat this by bringing in droves of relatives and it just looks ridiculous. It’s also distracting. Don’t allow yourself to be rushed. IDEA does not define the length of an IEP meeting. I’d say 90 minutes to 3 hours is probably average. If it’s not enough time, you meeting again. See number 1 above again–there is nothing that absolutely has to be decided upon today. Don’t forget to follow up. This one should be the first one, the last one and everyone in between. After EVERY IEP MEETING, you need to do a follow-up letter. See below. No ifs, ands or buts about it. Do it. I don’t care if you’re tired. It has to be done. The best last minute IEP advice from a Special Education Advocate…..
Is no advice at all. As a professional special education advocate, I cannot help you. If I get started with you, one hour or one day before your meeting, I will completely overwhelm you. This blog is 10 years old and has almost 1400 posts on here. Most are about IEPs. So where would you like me to begin? Evaluations? Present levels? Progress monitoring? Goal development? SDI suggestions? Placement suggestions? Behavior plan suggestions? Apps? Books? ESY eligibility? AAC/AT? Do you see my point? I would send you into the meeting completely overwhelmed and probably make things worse. The biggest piece of advice I have for you is that the IEP process (and it’s a process, not just a meeting) is ongoing. It’s 365 days a year. Do you want your IEP team only preparing for this meeting one hour before it starts? Then why are you? If you want the team to do progress monitoring throughout the year, you need to be doing the same. Want the team to be re-evaluating (in the broad sense, not actual re-evals) all the time? Then you need to be doing the same. You need to come to the meeting prepared if you expect the team to do the same. And that cannot be done an hour before or even a day before a meeting. It just can’t. So you know what we did in those situations? Listened. I went to those meetings, often meeting the child and parent just a few minutes before to get a quick rundown. I didn’t get to see IEPs or RRs or anything beforehand. So I went, sat and listened. Offered the best I could, as I am a fast thinker and problem solver. But mostly, listened to what the team had to say, then left. Then, I did all the stuff with the parent that needed to be done. Reading the IEP, reading the evals, doing the meeting recap letter. This all needs to be done all the time, year-round. This is about so much more than just one meeting. So if you need last minute assistance and you cannot reschedule the meeting, that’s my advice to you. Go, sit, listen, offer what you can. Don’t sign anything, and go home and regroup. You’re likely going to have to call another meeting if your child’s IEP is inadequate. Hopefully, this is a situation that you will only allow to happen once. Next time you’ll be prepared. I can get you there. I can get you to the point that you do not dread IEP meetings and resist even thinking about them until the last minute. Really, I can. But you’re going to have to put in the effort. 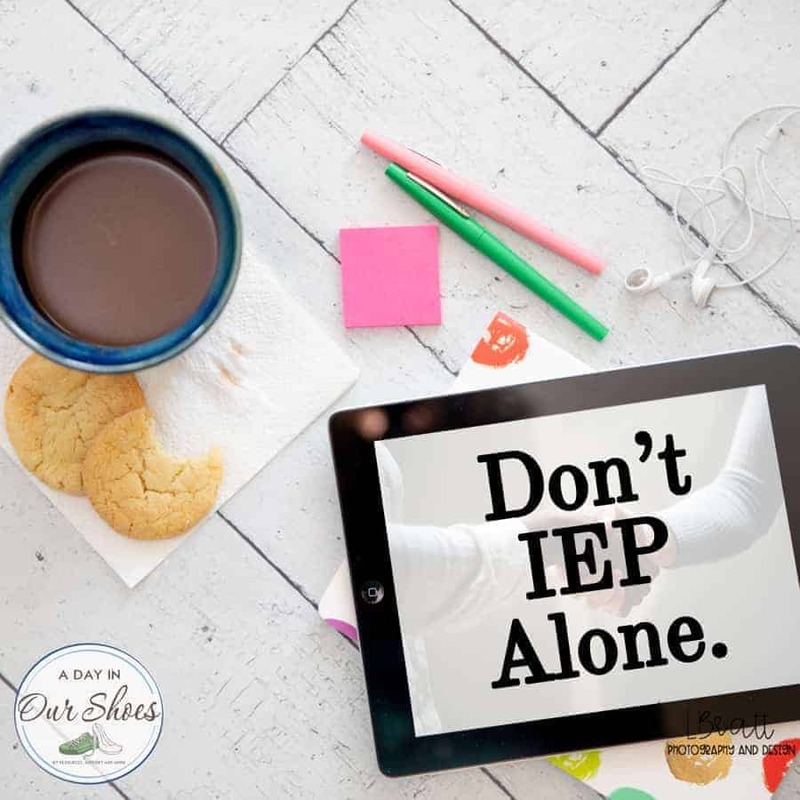 You’re going to have to commit to at least looking at your child’s IEP, their goals, their progress…at the very minimum you need to be reading this stuff quarterly. Minimum. My suggestion is monthly. You need to be corresponding, in writing, with your team at these 5 specific times throughout the IEP process. This is great last-minute advice if you truly are unprepared for your meeting. Please don’t be offended. I know this sounds harsh. It is. This is your wake up call. Postpone it if you have to. But my advice is to go and listen. Take your full time to read and digest the IEP. When you know better, you do better. Now you know better. This is about so much more than one meeting, and it deserves more of your time and attention. These are the cards we were dealt. How we play them is up to us. Author’s note: This is a post that was originally written several years ago but recently updated. Again, please do not be offended by this post. I have heard from at least a dozen special education advocates who have said, “Omigosh, thank you. So often I want to say this to friends who ask for advice.” If you self-identify here in this post, you don’t need to send me a nastygram stating “Hmph, you’re supposed to be helping people.” Right. I do. All day, every day. That’s kinda the point.